Riot police outfitted with body protection against blows. Armor is protective clothing intended to defend its wearer from intentional harm in military and other combat engagements, typically associated with soldiers and riot police. Armor has been used throughout recorded history, beginning with hides, leather, and bone, before progressing to bronze, then steel during the Roman Era, to modern fabrics such as Kevlar, Dyneema, and ceramics. Armor was also commonly used to protect war animals, such as war horses and elephants. Armor for war horses was called barding. Armor has also been produced for hunting dogs that hunt dangerous game, such as boars. Since World War I, armored fighting vehicles are protected by vehicle armor. In modern usage, armor (or "the armored") is also a heavily armored military force or organization, such as heavy infantry or heavy cavalry (as opposed to light infantry or cavalry). In modern armored warfare, armored units equipped with tanks serve the role of heavy cavalry and belong to the armored branch in a national army's organization (sometimes, the armored corps). Mechanized infantry has replaced heavy infantry. Greek Mycenaean 1400 B.C.E. armor. Throughout human history, the development of armor has always run parallel to the development of increasingly efficient weaponry on the battlefield, creating an "arms race" of sorts across multiple civilizations to create better protection without sacrificing mobility. Other significant factors in the development of armor include the economic and technological necessities of armor production. For instance, plate armor first appears in Medieval Europe when water-powered trip hammers make the formation of plates faster and cheaper. Also modern militaries usually do not provide the best armor to their forces since doing so would be prohibitively costly. In European history, well-known armor types include the lorica segmentata of the Roman legions, the mail hauberk of the early medieval age, and the full steel plate harness worn by later Medieval and Renaissance knights, and a few key components, (breast and back plates) by heavy cavalry in several European countries until the first year of World War I (1914-15). In November 2006, it was announced in Greece that the oldest armor that exists in Greece was restored and would be put on display soon. The armor dates from the Mycenaean Era around 1400 B.C.E., some 200 years before the Trojan War. In East Asian history laminated armor such as lamellar and brigandine were commonly used. In pre-Qin dynasty times, leather armor was made out of exotic animals such as rhinoceros. 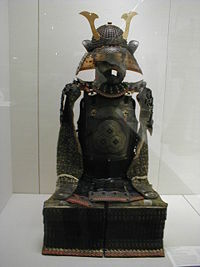 Chinese influence in Japan would result in the Japanese adopting Chinese styles, their famous "samurai armor" being a result of this influence. Chainmail, more properly known as mail, is made of interlocking iron or steel rings riveted together. Mail is believed to have been invented by the Celtic people in Eastern Europe in about 500 B.C.E. When these Celts moved West they took mail with them. Most cultures who used mail used the Celtic word "Byrnne" or a variant, suggesting the Celts as the originators. The Roman Army used mail for almost all of its history. After the collapse of the Roman Empire in 400 C.E. the infrastructure to make plate was largely lost in Europe, as a result mail was the best available armor during the ensuing Early Medieval period. Little by little, small additional plates or disks of steel were added to the mail to protect vulnerable areas. By the late 1200s The knees were capped with steel, and two circular disks, called besagews were fitted to protect the underarms. A variety of methods for improving the protection provided by mail were used as armorers seemingly experimented. Hardened leather and splinted construction were used for arm and leg pieces. The coat of plates was developed, an armor made of large plates sewn inside a textile or leather coat. Solid steel plate was then developed to protect the shins, feet, throat and upper chest, and soon (mid to late 1300s) these protective plates covered most of the mail. Eventually a full mail hauberk was no longer worn, as it had been made redundant. Mail continued to be used to protect those joints which could not be adequately protected by plate, such as the armpit, crook of the elbow, and groin. The small skull cap evolved into a bigger true helmet, the bascinet, as it was lengthened downward to protect the back of the neck and the sides of the head. Additionally, several new forms of fully enclosed helmets were introduced in the late 1300s to replace the great helm, such as the sallet and barbute. This period produced probably the most recognized style of armor in the world, associated with the knights of Late Medieval Europe, but continuing later through the 1500 and 1600s in all European countries. Heavy cawere being used before plate armor became the norm. In the 1400s, horsemen were using a small, mobile "hand cannon." Improved crossbows, and the first pistols and pre-musket long arms, began to take a heavy toll on the mail clad, and partially plated knights and foot soldiers. Rather than dooming the use of body armor, the threat of small firearms intensified the use and further refinement of plate armor. There was a 150 year period in which more and better metallurgically advanced steel armor was being used, precisely because of the danger posed by the gun. In the early years of pistol and muskets, firearms were relatively low in velocity. The full suits of armor, or even simple breast plates, actually stopped bullets fired from a modest distance. The front breast plates were, in fact, commonly shot as a test. The impact point would be encircled with engraving to point it out. This was called the "proof." It was not uncommon for a man in armor, mounted on a horse, to ride up closer to the enemy, wheel in a tactical maneuver called a caracole, and discharge his hand-cannon or later, pistols, right into the faces of the adversary at close range. Cross-bow arrows, if still used, would seldom penetrate good plate, nor would any bullet unless fired from close range. In effect, (and this has long been misunderstood), plate armor actually came to replace chain mail because it was relatively "musket ball proof." Plate would stop all of these at a distance. Hence, guns and cavalry in plate armor were "threat and remedy" together on the battlefield for almost 400 years. For most of that period, it allowed horsemen to fight while being the targets of defending musketeers without being easily killed. Full suits of armor were actually worn by generals and princely commanders right up to the second decade of the 1700s. It was the only way they could be mounted and survey the overall battlefield with safety from distant musket fire. Going back to the heyday of armor in the 1400s, most parts of the human body had been fitted with specialized steel pieces, typically worn over linen or woolen underclothes and attached to the body via leather straps and buckles. Mail (maille), steel mesh made of rings linked together, protected those areas that could not be fitted with plate, for example, the back of the knee. Well-known constituent parts of plate-armor include the helm, gauntlets, gorget or 'neckguard', breastplate, and greaves worn on the lower legs. Typically, full-body plate armor was custom-made for the individual. This was understandably a very time-consuming and expensive undertaking, costing as much as a family house or high-powered car in today's money. As such, it was almost exclusively the luxury of the noble and landed classes, with soldiers of lower standing generally wearing cheaper armor (if at all) typically limited to a helm and a breastplate. Armor often bore an insignia in the interior, that was only visible to the wearer upon removal. Full plate armor made the wearer virtually impervious to sword blows as well as providing some protection against arrows, bludgeons and even early musket shot. Although sword edges could not penetrate the relatively thin (as little as 2 mm) plate, they could cause serious concussive damage via the impact. Also, although arrows shot from bows could often pierce early plate at close range, later improvements in the steel forging techniques and armor design made even this line of attack increasingly difficult. By its apex, toughened steel plate was almost impregnable on the battlefield. Knights were instead increasingly felled by blunt weapons like maces or war hammers that could send concussive force through the plate armor resulting in injuries such as broken bones, organ haemorrhage and/or head trauma. Another tactic was to attempt to strike though the gaps between the armor pieces, using daggers to attack the Knight's eyes or joints. Contrary to common misconceptions, a well-made suit of medieval battle armor (as opposed to the primarily ceremonial parade and tournament armor popular with kings and nobility of later years) hindered its wearer no more than the equipment carried by soldiers today. An armored Knight (trained since his teens in its wearing) could comfortably run, crawl, climb ladders, as well as mount and dismount his horse without recourse to a crane (a myth probably originating from an English music hall comedy of the 1830s, and popularized in Mark Twain's A Connecticut Yankee in King Arthur's Court). A full suit of medieval plate is thought to have weighed little more than 60 pounds (lb) (27 kilograms (kg)) on average, considerably lighter than the equipment often carried by the elite of today’s armies (e.g., SAS patrols have been known to carry equipment weighing well over 200 lb (91 kg) for many miles). World War I German Stahlhelm and prototype armor. Image by Halibutt. Gradually starting in the mid 1500s, one plate element after another was discarded to save weight for foot soldiers. Breast and back plates, however, continued to be used through the entire period of the 1700s through Napoleonic times in many (heavy) European cavalry units, all the way to the early twentieth century. Rifled muskets from about 1750 and later could pierce plate, so cavalry had to be far more mindful of the fire. At the start of World War I the French Cuirassiers, in the thousands, rode out to engage the German Cavalry who likewise used helmets and armor. By that period, the shiny armor plate was covered in dark paint and a canvas wrap covered their elaborate Napoleonic style helmets. Their armor was meant to protect only against sabres and light lances. The cavalry had to beware of high velocity rifles and machine guns like the foot soldiers, who at least had a trench to protect them. Machine gunners in that war also occasionally wore a crude type of heavy armor. Today, bullet proof vests made of ballistic cloth (e.g kevlar, dyneema, twaron, spectra etc.) and ceramic or metal plates are common among police forces, security staff, corrections officers and some branches of the military. For infantry applications, lighter protection (historically known as a flak jacket) is often used to protect soldiers from grenade fragments and indirect effects of bombardment, but usually not small arms fire. This is because assault rifles usually fire harder, higher-energy bullets than pistols, and the increased protection needed to stop these would be too cumbersome and heavy to use in combat. The U.S. Army has adopted interceptor body armor, however, which uses Enhanced Small Arms Protective Inserts (E-S.A.P.I) in the chest and back of the armor. Each plate is rated to stop a range of ammunition including 3 hits from a 7.62 AP round at a range of 10 m, though accounts in Iraq and Afghanistan tell of soldiers shot as much as seven times in the chest without penetration. Despite advances in the protection offered by ballistic armor against projectiles, as the name implies, modern ballistic armor is much less impervious to stabbing weapons unless they are augmented with anti-knife/anti-stab armor. 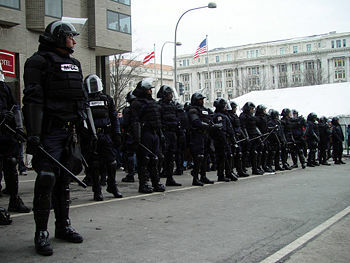 Riot police are usually equipped with armor against blows. 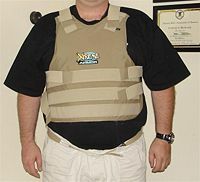 International Testing Standards for Modern Personal Body Armor. This page was last modified on 14 April 2016, at 15:15.